Send them off on their travels in style, with this elegant St Christopher pendant in contrasting 9ct rose gold and white gold. Finished with a fine chain. 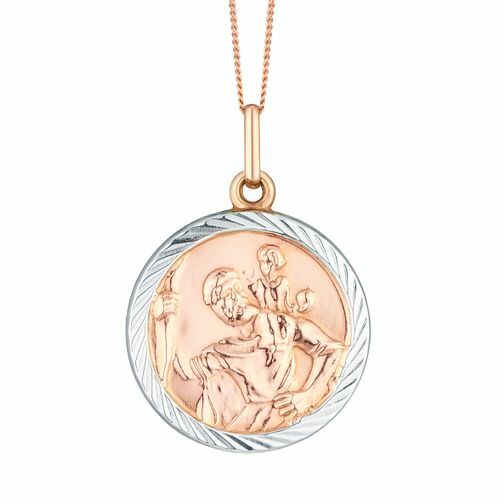 9ct Rose Gold & White Gold St Christopher Pendant is rated 1.5 out of 5 by 2. Rated 2 out of 5 by Anonymous from A disappointment The saint christopher is a huge a let down , my husband bought it for me for my 50th birthday . When I opened it I was so pleased , then I put it on the chain is super thin & the pendant is is like hollow plastic spayed . All’s I can say a huge let down for the money spent on it .